The Stages Shimano Ultegra R8000 Power Meter combines Shimano’s award-winning Ultegra groupset with Stages Cycling’s proven performance and dependability. The result is an accurate, lightweight, durable power that comes ready to ride on a Shimano R8000 crank arm. Compatible with all Shimano Hollowtech II road cranks, the Stages Ultegra R8000 runs off of a CR2032 battery and features 200 hours of battery life. In addition, the power meter is extremely lightweight – adding only 20 grams to the weight of the crank arm. All Stages power meters are compatible with both ANT+ and Bluetooth SMART devices, which means you can use your favorite bicycle computer as well as a smartphone or tablet. The Stages R8000 power meter (Generation 3) features radio antennas that are 6x more powerful than the previous version. This means better compatibility with both bike computers and watches. The new versions also feature improved accuracy (+/- 1.5%) and have an LED indicator light on the housing for improved ease of use. You can install a Stages power meter and be up and running in minutes. Simply remove your current left-side crank arm and bolt on your Stages power meter. No special technical skills required! On just one CR2030 battery, the Stages provides 200 hours of battery life. In addition, the power meter offers tool free battery replacement. You can have the battery changed in about 60 seconds! With both ANT+ and Bluetooth SMART capabilities, you can use the Stages power meter with your favorite bicycle computer, smart phone, or tablet. The Stages power meter adds a mere 20 grams to your bike. This makes it one of the lightest power meters you can buy. 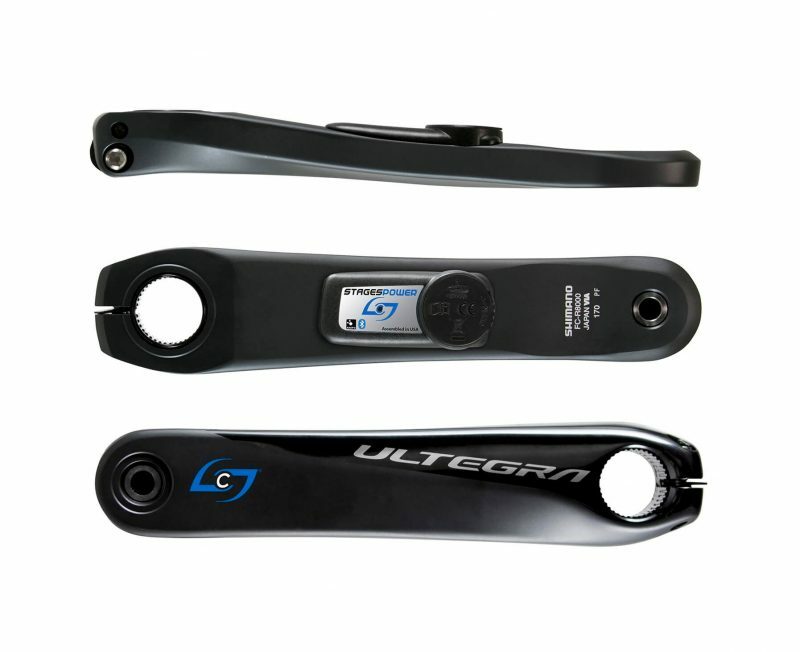 The Stages Shimano Ultegra R8000 Power Meter is compatible with all Shimano Hollowtech II road cranks. This is my third power meter from PMC and as usual great customer service and lovely communications. In regards to the stages PM, this is my second 3rd Gen and so far no issues with both and they work as expected with logical and comparable power readings. I strongly recommend PMC and stages PM for every one interested in keeping track of their training objectives. Hi Waleed. Thanks for the review and for being a great customer! We’re glad the Stages R8000 Gen. 3 is performing nicely for you. Keep up the good work on the bike! This is actually my first power meter. It is very user friendly, easily compatible to my devices and so far have had zero issues and not expecting to. Josh was super helpful with questions I had and helped me narrow down my choice. Would totally buy again from PMC. Hi Heather. Thanks for the review. You can’t go wrong with this power meter and I’m glad you’re enjoying it! I’ve been using a Stages Gen 3 power meter on a Shimano R8000 left-side crank arm for about a year. So far it’s been almost flawless. I’ve used the power meter extensively both indoors on Zwift and outside. Initial battery lasted more than 2,000 miles. During that time, the meter had a few brief power drops to zero outside or when connected to Zwift. That was annoying but it rarely happens. I’ve ridden in the rain and washed the bike several times with no problems. As for accuracy, it’s within 5-8 watts of my Favero Assioma power meter pedals I used to have. Those Assiomas worked well too but the release tension was so high I injured my knees. So the Stages works better for me because I can use any pedal system I want. Be careful when replacing the battery to ensure the rubber o-ring seal is installed correctly and no contaminants gets inside. And don’t install the battery backwards like I did, it’s a pain to get back out. It’s a solid and reliable power meter. Hi PacificNWRider. Thanks for the pretty great review of your Stages Ultegra R8000 power meter. Also, if you need any extra o-rings or battery caps, just let us know!